As adults, we often look upon the world of children as being idyllic. With no bills to pay, no work commitments, and no complicated adult relationships, kids can focus on having fun – right? Unfortunately, humans are affected by stress from birth. All children face anxiety, sadness and fearfulness at some point. Like adults, kids live in a fast-paced world. They face conflicting priorities, competition, and ever-changing social dynamics. And stress is just one affliction facing the current generation of kids. Attention Deficit Hyperactivity Disorder (ADHD) is one the rise. Obesity levels are at an all time high. Many parents are concerned about the effects of hours spent in front of computers and game consoles. Let’s face it – kids need yoga just as much as adults do. The benefits are similar: yoga provides a way for kids to de-stress. It gives them a space free from competition to improve self-esteem. An increase in attention span and focus are often apparent with a regular yoga practice. Through yoga, kids learn the value of kindness. They discover compassion for each other and for other living beings, and develop increased awareness of the impacts of their own actions on the world around them. And of course, physically, yoga improves flexibility, strength, balance and body awareness. So what’s the difference between yoga for adults and yoga for kids? 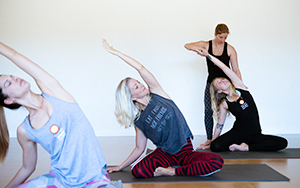 While children and adults might attend yoga classes for similar reasons and benefit from yoga in the same ways, a very different approach is required to teach kids. In a group of adults, yoga often feels like a serious business. Some teachers use humour, but it’s generally just a brief interlude, with a few giggles punctuating the otherwise unbroken sound of ujjayi breath. In contrast, kids yoga classes are a joyous affair, kids learn best when they’re having fun. For those of us accustomed to teaching adults, kids can present a challenge – bringing a group of kids into your sacred yoga space is inviting chaos. A kids yoga class will vary significantly depending on the age of the group, but may incorporate music and song, lots of silly props, noisy games, stories, relaxation and visualisation, meditation, Mandala painting and more. The kinesthetic, aural, visual, intra- and interpersonal aspects of each class help keep kids involved while having fun. The focus on interaction is much higher than in most general yoga classes. Kids interact through games, partner work – including basic acro yoga and Thai massage moves – and shared storytelling. You’ll need to be prepared for noise, mess, and a whole lot more noise. The best approach is to embrace it rather than fighting it for the first half of class, then rein it in as you move towards relaxation. Use a theme to keep the kids’ attention. For example, take them on a different journey or adventure each week, to a new country, to the beach, to a farm. You could even ask them to contribute ideas for future classes. Adult yoga classes follow an arc, generally beginning with asanas that stimulate heat and energy, then winding down towards Savasana. Similarly, kids yoga classes need an arc – begin by centering and introducing your theme, then allow the energy to build with a crazy game that allows the kids to interact with each other. Once the kids have had the opportunity to release some pent-up energy, start the process of calming them down. You could invent a game that requires silent collaboration, or give the kids a creative outlet such as modeling their favourite asana from playdough. When it’s time for Savasana, allow the kids to find any comfortable position, but ask that they remain still. Have a guided visualisation prepared to keep their attention. You might be surprised at how attentive they are! Throughout your kids yoga classes, balance your meticulous planning with spontaneity. If one of the students has a great idea for a game, let them run with it.